Three suspected members of the Boko Haram sect have been arrested in Ajao Estate area of Lagos. The suspects were arrested by members of the Hausa Community in Lagos.The suspected terrorists were hiding among some Hausa acquaintances before they were fished out by the leaders in the area, according to an Islamic cleric, Mohammed Abdullahi, who spoke yesterday during the Isolo Townhall meeting organised by the Lagos State acting Commissioner of Police, Edgal Imohimi. The townhall meeting was between the stakeholders in Area D Command and the police held in Isolo. The Cleric said, “A lot of people think Boko Haram issue is just about the Northeast, but they are mistaken. We have been arresting fleeing Boko Haram members in Lagos. I do not know if it is as a result of the proximity to the airport. Most of the escapee Boko Haram members who come to Lagos have been arrested in Ajao Estate. 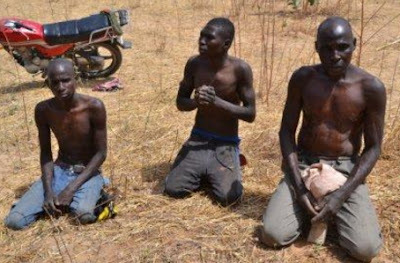 Just three weeks ago, we arrested three of them who ran from Borno State.We have a way of identifying them. The Seriki Hausa in Ajao Estate has the contact of all the local government chairmen in Borno State. That way, we usually know those Boko Haram elements who have fled the area to other parts of the country. “We have been doing this since 2014 and we have been working in collaboration with the Joint Task Force (JTF) in Borno. Once we identify them, we contact the JTF and they come and arrest them. Reacting to Abdullahi’s disclosure, Edgal assured that the police would verify the claims by the cleric because there were serious security issues. He urged residents to be more vigilant, noting that Lagos cannot be isolated from security challenges in other parts of the country. “We all know that Lagos is the melting pot of the country. Because Lagos is functioning, we are getting influx of people at astronomical rate,” he said.